New service connection application shall be made in prescribed Service Connection Application Form; the same application form can be used for obtaining permanent / temporary service connection. Simplified Service Connection application forms are available at a cost of Rs 10/- at Electrical Sections. (The format of application is available for download from the bottom of this page). 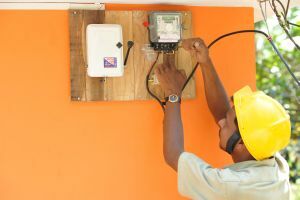 The applicants for weatherproof service connection not requiring phase addition, post-insertion, support post etc can remit security deposit and cost of effecting supply at standard rates along with the application fee, on the basis of the data furnished in the application form. In case of other consumers, intimation to remit Security Deposit and cost will be given through mail after site inspection. Duly filled application form along with accompaniments and requisite application fee can be handed over to authorised KSEB official at Electrical section Office or forwarded through registered post to Assistant Engineer of the concerned Electrical Section. The following documents shall be produced along with application. Please refer to Supply Code 2014 for more details. 1.Proof of Identity (Photo Identity Card). 3.Sketch showing details of connected equipments, marked in building plan. 6. Test Certificate of metering equipment, if consumer supplies the same. 7.Certificate for claiming exemption from payment of cost for providing service connection, if applicable. 8.Consents / Authorisations / Approvals wherever applicable. 9.Service Connection Agreement, if applicable.